The above info came from atomofish, and was edited by yours truly (contact me). The image came from atomofish. In this new chapter of the Yu-Gi-Oh! saga, 5D's takes place long after the exploits of Yugi Mutou. It is now the year 2021, and Domino City has transformed into New Domino City, a place where society is strongly divided between the rich and the poor. 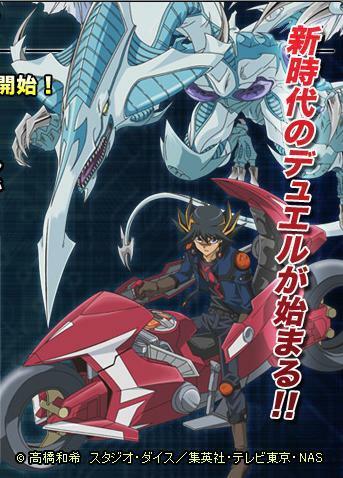 "Riding Duels" is the latest version of Duel Monsters, where events are played in large stadiums and involve the use of motorcycles with built-in Duel equipment called "Duel Runners." During the duels, some of the cards are shown individually, and you hear a female voice explaining what the card does like the effect of syncro chick, a card that Yusei has.